ESPN’s COLLEGE FOOTBALL coverage took up 4 of the Top 5 slots on Saturday cable, with telecasts ranging from 0.49 for the late afternoon game to 1.07 to the one that preceded it, while smaller-market games on ESPN2, ESPNU and Fox Sports 1 were in the 0.19-0.31 range. 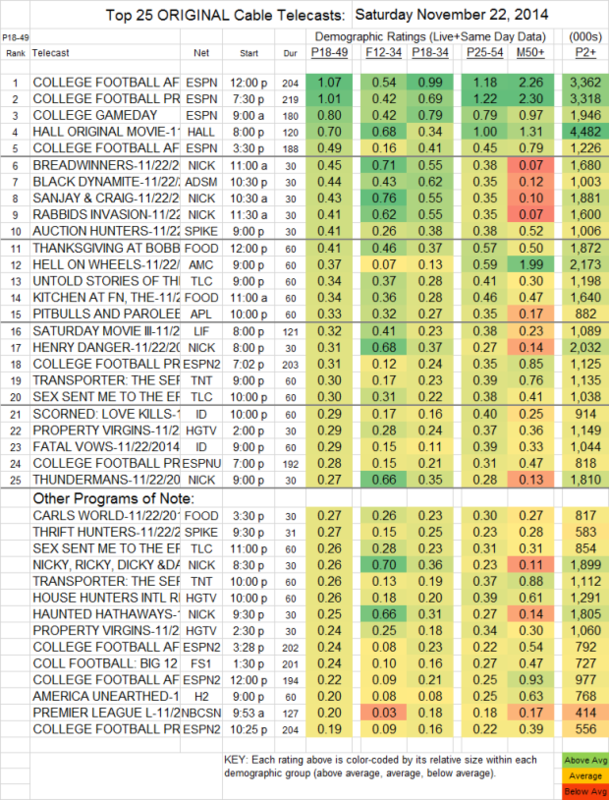 The ESPN run was interrupted by Hallmark Channel’s original movie at 0.70 (Lifetime’s movie for the night was at 0.32, steeply down from last week’s 1.35 Aaliyah movie). BLACK DYNAMITE (Adult Swim) gained a tenth to 0.44. The season finale of HELL ON WHEELS (AMC) rose 0.06 to 0.37. TNT’s 2 hours of THE TRANSPORTER were at 0.30/0.26, up a tenth or more from last week. On Starz, THE MISSING is moving in the wrong direction, down from 0.05 last week to a barely-existing 0.007, and with 197K total viewers.